You know you’re a mother when your first post is about diapers. Actually, I wasn’t a mom when I made my first diaper cake. And I had no idea what a diaper cake was, but somehow, we girls decided we wanted a diaper cake to adorn our friend’s baby shower. Oh the beauty of Google! 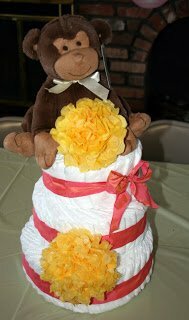 After spending way too much time looking at images of diaper cakes and reading instructions on creating diaper cakes, I decided to make my own. I went out and bought a box of Pampers Swaddlers Size 1, 216 count. In my naïveté, I figured 216 itty bitty diapers would make a good average sized cake. Boy was I wrong. This cake was BIG, and heavy and dense. 1. First tier – Start with a bunch of diapers, and a flat bottomed pan. Using the pan as a “mold”, fan the diapers out in a pinwheel shape. Keep adding diapers until it reaches the desired size. This became the first, or bottom, tier. I had my husband, the Eagle Scout, create a string loop around the diaper pinwheel and tied it with a taut line hitch knot. You can see a neat little animation of it here. 2. Additional tiers – Repeat Step 1 for each tier, decreasing in size. 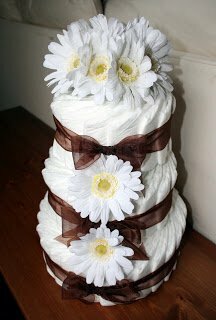 Add and take out diapers from each tier as necessary in order to keep the tiers proportional like in a real cake. Do this until you have used up the desired number of diapers, or if you’re like me, until you run out of diapers. 3. Assembly – Choose something to use for a center column and thread each tier onto this center column. 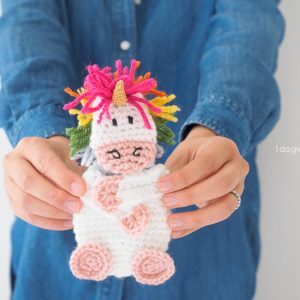 You’ll have something like a huge diaper stacking toy. I chose to use a bottle of champagne as a center column that runs the height of the cake and stacked each tier onto the bottle. The bottle ended up not being tall enough, so I fudged a bit at the top with some rolled up cloth diapers. 4. 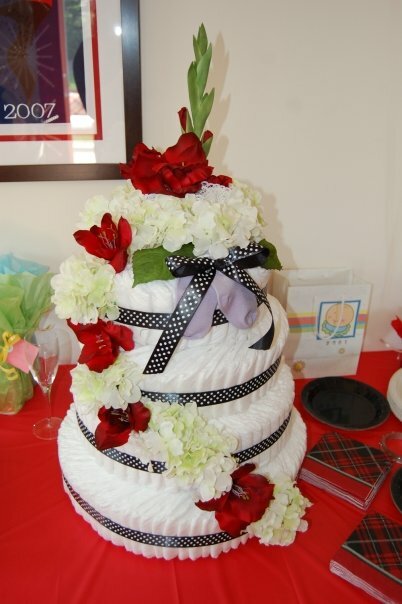 The Fun Part – Wrap each tier in ribbon. Add desired embellishments on top and around the cake. 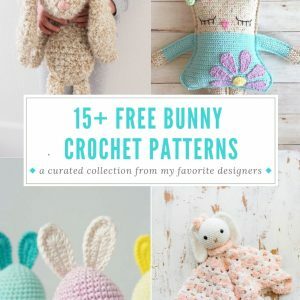 You can use flowers, stuffed animals, baby items or whatever floats your boat. I’ve made other cakes since then, and have changed some things along the way. I don’t use champagne bottles anymore, for one thing. I either use rolled up receiving blankets in the center, or just use wooden dowels throughout the cake to hold it together. Other times, I’ve used long flower stems instead of dowels, and receiving blankets around the outside instead of ribbon. I’ve also replaced fake flower stems with tissue paper flowers for a different look. 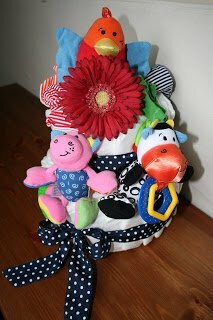 I like my diaper cakes to be simple in order to show the pinwheel of the diapers, so I don’t normally overstuff it with toys and accessories, although doing so does make for a very colorful gift. 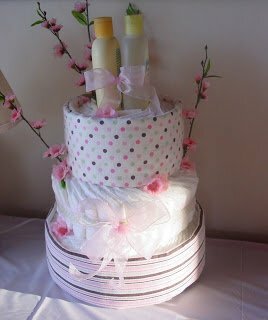 I’ve found these cakes to be a hit at baby showers, and I’ve seen similar cakes made out of towels for wedding showers as well. I’ve also seen a whole assortment of baby washcloth cupcakes and lollipops and diaper tricycles too. Can’t wait to give those a try! So this is the end of my very first post. I’ll have to remember to take more pictures of my other projects, and hopefully, there will be many more fun posts! 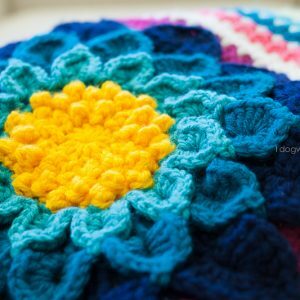 I like all matters of your blog!